Apparently the USPTO wants to make it possible for the filer to somehow influence the physical sequence in which recordations appear in the Abstract of Title. As far as I can see this is not a good thing for USPTO to do. 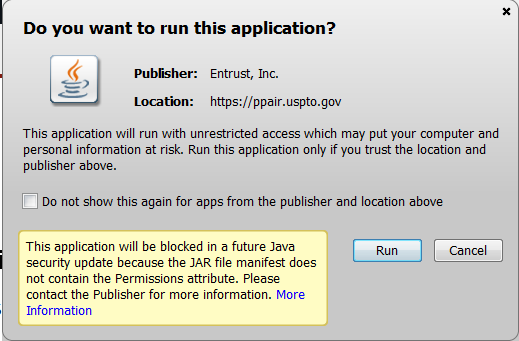 Regular users of USPTO’s Private PAIR and EFS-Web systems are reminded several times a day that the only way that they make use of the systems is by permitting a computer program called the Entrust java applet to run o n their computer. Well, the USPTO is still not out from under its mountain of paper due to its massive system crash on May 14. Readers will recall the massive system crash on Wednesday, May 14. What will stick in your mind is that May 14 is the day that you had to use USPS’s Click-n-Ship system to print a Priority Mail Express label so that you could file a US patent application by taking it to your local post office to be received in person by a postal service employee. You and several thousand other patent practitioners who would have normally used EFS-Web to do your filing, leading to a mountain of paper at the USPTO. From our perspective, here is the USPTO’s progress at getting out from under the mountain of paper. Last Wednesday, May 14, was a day when USPTO’s main patent-related e-commerce systems all crashed. As I mentioned in my blog posting about the crash, the practical consequence for thousands of patent practitioners was the need to carry out paper and postal service filings, following Rule 8 and Rule 10 as we all used to do back before there was an Internet. Now the chickens are coming home to roost. USPTO is under a mountain of paper. Here’s a rant about DRM (digital rights management) systems and how annoying they can be. Today’s culprits are Amazon and Microsoft — each of which led to some frustration. For filers, the main thing to keep in mind is that if you are filing a new patent application or you are entering the US national stage, you can’t fax it in. You will have to take it to the Post Office and send it by Priority Mail Express (née Express Mail). We sent our youngest associate to the late-night Post Office in Denver a few minutes ago and he successfully mailed the one patent application that had to go out today from our office. For lesser tasks such as responding to an Office Action you can try to fax it. As a reminder the fax number is 571-273-8300. It looks like USPTO’s fax server is unable to keep up with the traffic, however. One of our faxes has failed three times and we have not managed yet to get it to go through. We finally had to resort to a Certificate of First-Class Mail for an envelope that we dropped into a mail box shortly before midnight. Having delivered the main emergency message, I will now talk about what USPTO did wrong that led to today’s disaster. The Republic of Korea has joined the Hague Agreement. If you fail to get your certified copy of your foreign priority application into the hands of the USPTO by sixteen months, you’ve lost your priority claim and will have to file a petition to get it back. Suppose you try to do this electronically and inadvertently get it wrong? USPTO’s present policy is to wait until past sixteen months to let you know. That’s not nice, and USPTO needs to change its policy. When you log in to USPTO’s Private PAIR and EFS-Web system, you have to go through a cumbersome process. You have to mouse around and find a “crypto certificate” on your hard drive that proves your identity. You have to wait for a very slow “Java applet” to run, taking some tens of seconds. And you have to type in a password that is required to contain at least one smiley face (just kidding). This would not be so bad except that this system logs you out at more or less random times, after anywhere from ten to sixty minutes of inactivity. A quick trip to the bathroom or coffee machine can lead to your having to log in all over again. In a normal work day a USPTO customer might be forced to log in again a dozen or more times. A couple of years ago I surveyed users of PAIR and EFS-Web about this system of forced logouts. The vast majority of respondents said that for them, this system of forced logouts is a bug, not a feature. I passed the results of the survey along to USPTO people who are responsible for this system. Unfortunately in the two years that have passed since this survey, USPTO has not done anything to improve this situation.